An Indianapolis pet saved a family’s bacon during an unusual home break-in on Indy’s east side this week. 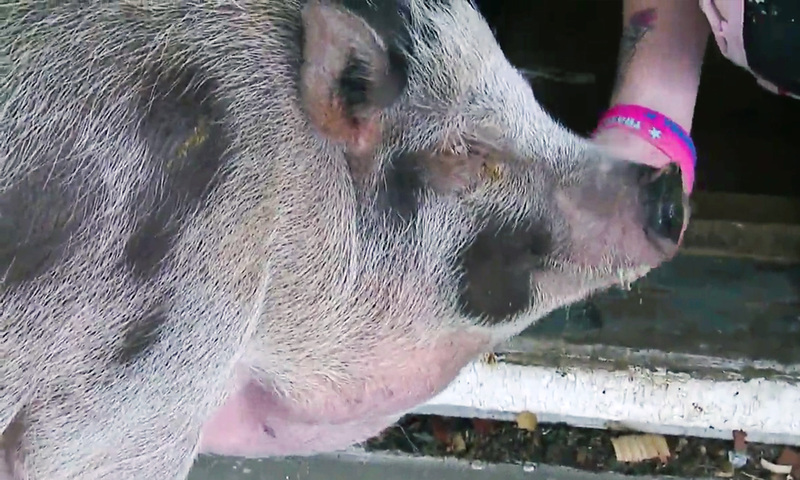 Dumplin’s owner says she saved the full-grown swine from a rescue earlier this year. “The moment I saw him I knew he loved me instantly. He’s the perfect animal,” said the homeowner. Unfortunately, home break-ins are nothing new in the neighborhood near Michigan and Sherman. Dumplin’s family bought the east side home just a couple of weeks ago. Including the break-in at Dumplin’s home, a search of police reports shows there were three home burglaries on the same day separated by just two blocks. “I guess it’s something I should have looked into. It’s common in the neighborhood. I didn’t think about it. I was excited to be buying my first home,” said the homeowner. Dumplin’s owner is just relieved the pig didn’t get hurt during the crime and says she wishes more people would adopt pet pigs, even if they won’t always keep the bad guys away. “There’s tons of pigs in shelters that don’t have homes and they’re great animals,” said the homeowner. Dumplin’s owner hopes the suspects are caught before they break into anyone else’s home. In the meantime, anyone with information on the case can always contact Crime Stoppers at 317-262-TIPS.